LoneStarCon 3, this year's World Science Fiction Convention, has opened Hugo nominations for 2012. You do need to be a member to nominate. A member (attending or supporting) of LoneStarCon, this year's worldcon, or Chicon 8, the 2012 worldcon in Chicago, OR LonCon, the 2014 worldcon in London. Any one of the three will do. All works first published or broadcast in 2012 are eligible. Nominations close on March 10. What works you choose to nominate is, of course, entirely up to you, but as in past years, I would like to use my bully pulpit here to bring some worthy choices to your attention. In some categories I have eligible works of my own, so I will not pretend to be a disinterested party in those cases. In other categories, my recommendations are just that -- shout outs for books, stories, and writers I've enjoyed during the past year. I am going to start with the grab-bag category of "Best Related Book" this time around. This category is always an odd one, taking in all the stuff that does not fit comfortably in the other categories. Non-fiction of various sorts, mostly; art books, collections of critical essays, biographies and autobiographies, and other, stranger stuff. Not normally a category in which I have a horse in the race... but this year two of the possible candidates are books to which I contributed introductions, and a third was about my work. Brian Cogman's INSIDE HBO'S GAME OF THRONES is a "making of" book, of the sort generated by every major feature film and television show these days... but I happen to think Brian went way beyond the usual puffery, and produced a really terrific volume. (And yes, there's an intro by me). Brian has been part of the HBO series since the start (he was the first person hired by David and Dan when they got the green light), giving him much greater insight into all the behind-the-scenes stuff than most "making of" writers, who are more commonly journalists brought in on a work-made-for-hire basis. 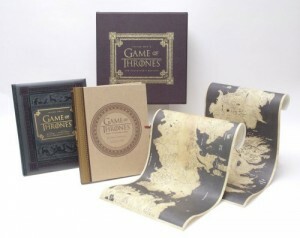 INSIDE HBO'S GAME OF THRONES is a gorgeous volume too, and the boxed limited edition set with all its extras is truly fantastic, a real treat for the collector. There were a number of books about A GAME OF THRONES (the HBO series) and A SONG OF ICE AND FIRE (the books) published last year, some as actual print volumes, others as ebooks. The quality of the criticism and essays contained therein varied greatly, to be sure. I haven't seen all of these, by any means, and haven't read all of those I did see (some publishers send me copies, some don't). 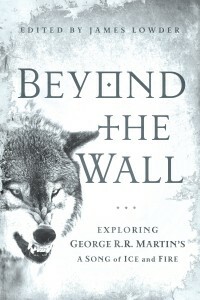 Of the critical books I did chance upon, however, the one that impressed me most was James Lowder's BEYOND THE WALL. As the subject of these essays, I will be the first to admit that I have a skewed perspective here. Nonetheless, I think Lowder put together a strong, balanced, and diverse collection of essays, and the quality of writing here was distinctly higher than in some similar volumes. I think I would have enjoyed reading this one even if it WASN'T all about me myself and I. Read it for yourself, and decide. 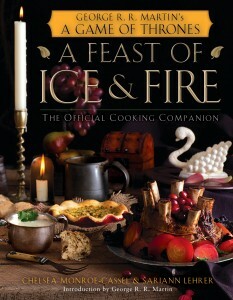 A more unusual... but equally worthy contender... for a nomination this year is another Ice & Fire spinoff: A FEAST OF ICE AND FIRE, the incredible Westerosi cookbook by Chelsea Monroe-Cassel and Sarianne Lehrer. Great recipes, and a great looking book, FEAST grew out of their blog, the Inn at the Crossroads. And yes, this is another one to which I contributed an introduction. Seemed only fair, since Chelsea and Sarianne and their minions plied me with lemon cakes all through my DANCE WITH DRAGONS tour. A good read, and some yummy eating... and so far as I know, there has never been a cookbook nominated for a Hugo Award before. Why not make this one the first? So... when making your nominations for Best Related Book, do consider these three. And whether you nominate them or not, do NOMINATE. You have until March 10. I came so close to using your book for my thesis! The only thing stopping me was my lack of funds (poor college student here) and the fact that I wasn't sure there was an essay that was relevant to my thesis. Regardless, it is a book I want to purchase sometime in the near future. Good luck with the Hugos! !